Compatible with most robotic workstations, this polypropylene storage rack can be used with most cell harvesters and leading 8- & 12-channel pipettors. 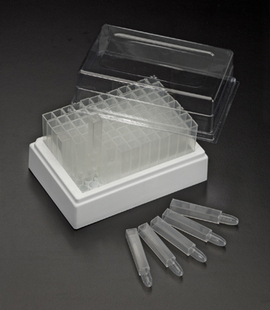 It contains 96 removable polypropylene square tubes in a 8 x 12 configuration, each having a 2.1 ml capacity (2 ml when capped). Although the tubes are square, the bottom is round to facilitate emptying. For procedures requiring a low surface tension such as protein and nucleic acid work, select a special tube (cat.# T105-20LST) using a type of polypropylene specifically designed to avoid potentially harmful lubricants (such as silicone) while minimizing liquid retention. The autoclavable rack and tubes (not the cover) are ideal for storage of blood and other biological samples at temperatures, from -170 �C. for freezer storage, up to 121 �C. Tubes are available separately. A PVC cover is also supplied for full protection of tube contents. Racks are stackable to save on storage space. Available in sterile and non sterile versions.